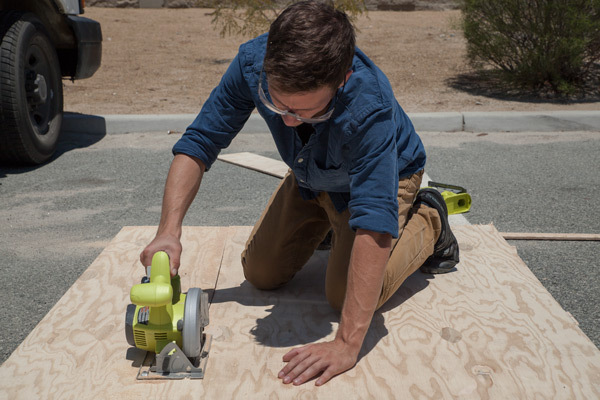 The floor serves as the base of your build and an easy introduction to the basic principles of carpentry. 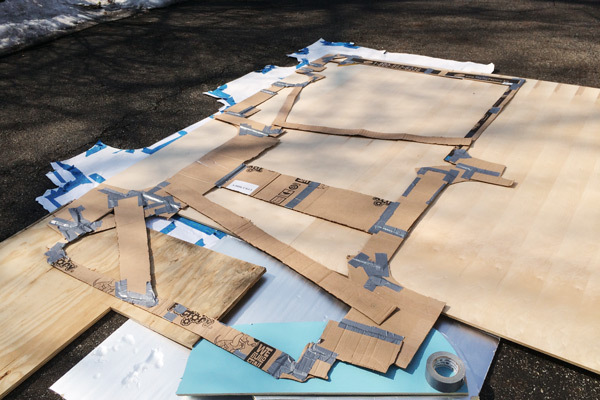 If you still have a flawless floor template from insulating you can use it for this step. Otherwise, make a new one. 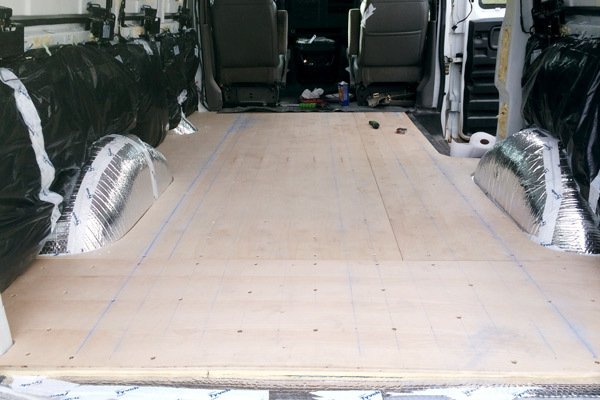 The raw sheets of plywood will be smaller than the floor of your van. You’ll have to create another mosaic layout with the plywood. 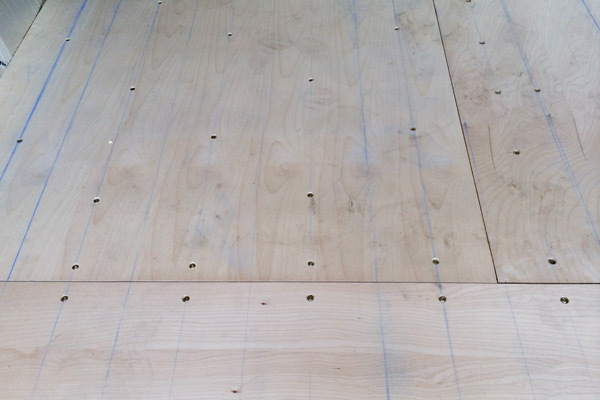 Try to differ the seams of the wood subflooring to that of your rigid panel insulation. Triple check the accuracy of your template before cutting expensive birch plywood. Scraps of cardboard were used to make this template. It was a pit of a pain to move out of the van without screwing up the proportions. Some minor adjustments may be necessary after a rough fitting. 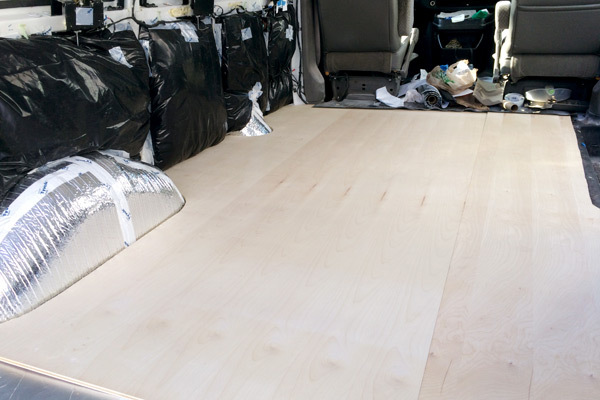 Once your subfloor is in place inside the van you’ll need to secure it to the metal cargo van floor through the layers of insulation below. I used a chalk line to mark where the cargo van’s floor grooves are and then only drilled where the grooves were raised. Make sure to use anti-rust screws and countersink them into the wood. I was still able to see the grooves of the van's floor at the very back and very front of the van. Then it was just a matter of connecting the dots. I broke about three drill bits making the pilot holes for these screws. Be prepared for a last-minute run to the hardware store. 3 Fill and sand screw holes. Caulk seams. Self explanatory. Fill with wood filler. 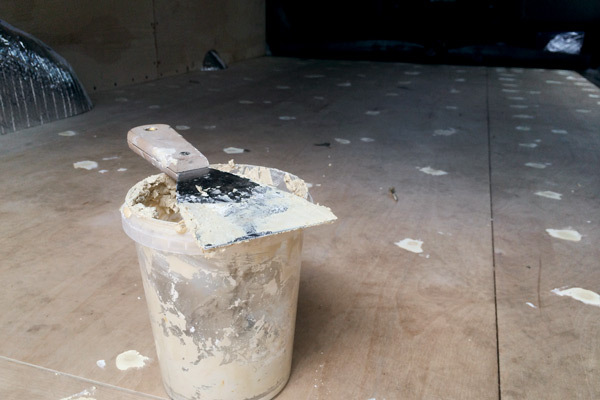 Use only medium to fine sandpaper grit so you don’t sand too much off your wood subfloor. Using caulk, fill the seams present in the mosaic layout of your subfloor. Make sure the caulk is level with the wood. You may have to fill a hole with filler a second time after the initial sanding. Waiting to install your vinyl floor will prevent it from being scratched or damaged while building the walls and ceiling. Putting up your walls beforehand will also shrink the flooring that you need to cover with vinyl. This means you’ll be able to use six foot wide single sheet vinyl instead of the full 12 ft wide variety.